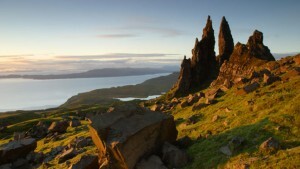 The Isle of Skye is one of the most beloved Scottish islands and a favourite with walkers. It has a fascinating history and offers stunning scenery – not just on the island, but on the journey there as well. Let’s go for a long walk on Skye. Grading: This walk is graded strenuous as it passes through remote country, the ground is rough and some days involve considerable ascent and descent. Isle of Skye is located on the west coast of Scotland. You can get there by taking the ferry from Mallaig, which gives you the opportunity to ride on the beautiful West Highland Railway. Alternatively, you can drive to the village of Kyle and take the Skye Bridge, offering equally jaw-dropping scenery. 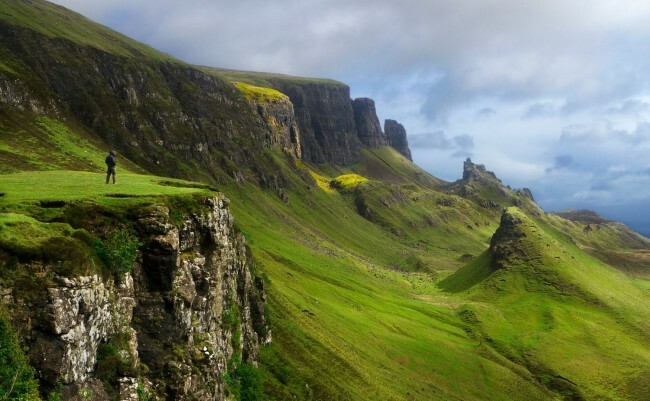 Isle of Skye is one of the most popular islands in Scotland, and it attracts visitors from all over the world. The fascinating geology, long history and dramatic scenery makes for an inspiring place to visit. Skye’s remoteness has led to it still having a relatively large number of Gaelic speakers compared to the rest of Scotland. Along with the language, many traditional forms of art have been kept alive on the island, such as a strong folk music scene. You’ll also find plenty of art galleries and craft shops across Skye, the livelihood of many of its residents. Once voted the 4th best island (in the world!) by National Geographic, the Isle of Skye has a lot to offer the keen walker. Skye has no less than 12 munros (summits over 3,000 feet) and the stunning Cuillin mountain range is a favourite with hillwalkers. These peaks can be viewed from all over the island, and the dramatic Highland landscape is further emphasised by numerous lochs and moors. The walks on Skye are not easy, but the beauty of the unspoilt landscape, as well as the plethora of wildlife – including red deer, Scottish wildcats, pine martens and mountain hares – makes it a truly unique walking experience. Staying in cosy b&b’s and small hotels, you’ll also get the chance to sample fresh seafood and traditional Scottish dishes in order to get to know the local culture and flavour. 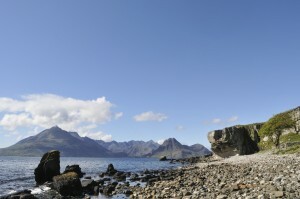 April and May are popular months to visit Skye, as it means avoiding midges. However, the summers are warmer and equally popular, particularly with international visitors. We recommend booking early, as the demand for accommodation can be high, especially at weekends. Skye can best be reached by flying into Glasgow or Edinburgh airports and taking the train to Mallaig where the ferry departs from. Alternatively, you can fly to Inverness airport from London, Manchester, Amsterdam or Dublin, which will shorten your journey time to Skye. 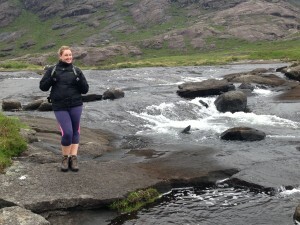 Contact [email protected] if you’d like more information or read about our walking itinerary for Skye online. For some more inspiration, or something a little easier, why not have a look at our tours to the other Scottish islands?